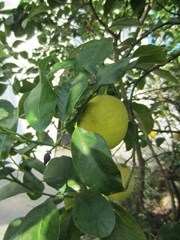 When grown in Zones 9 to 11, lemon trees will grow in fertile, well-drained soil in a sunny position protected from wind. During the growing season they need plenty of water and regular small applications of nitrogenous fertilizer to promote growth and fruit size. They need very little pruning. In indoor cultivation, place your plant in a well-lit, but not too warm location. A low temperatures in winter will encourage flowering. Place outdoors in late May to encourage natural pollination. Bring inside in September. Pinch to control shape and improve bloom. The fragrant flowers develop into fruit, but it may take a year before they attain the correct color(maturity) for harvesting. As a pot plant in cold climates.